1. The Ancient Greeks adopted the practice of leeching to balance the four humors in Galen’s theory of the human body. 2. The majority of leeches live in fresh water, although there are a few marine varieties too. 3. They have suckers on each end of their bodies. 5. Most species have a 3-bladed jaw that slices through the skin of the host. 6. Hirudo Medicinalis – medical leeches – have three jaws with approximately 100 sharp teeth at the rim. 7. They store blood up to 5 times their body mass. 8. Medical leeches only need to feed twice a year because they have a super-slow digestive system. 9. The European variety were so popular in the 19th Century that they actually became endangered. 10. Leeches attach themselves to feed, but fall off naturally to digest the host’s blood once they are bloated. 11.They feed between 20 minutes – 2 hours. 12. The safest way to remove these parasites is by using a blunt object to break the seal of their suckers. 13. If they are shocked from the host they regurgitate their stomach contents, which often causes infection in the bite. 14. Leech saliva makes wounds bleed more readily. 15. The anticoagulant in their spit is called hirudin. 16. Leech bites generally don’t hurt because they also release an anesthetic when they penetrate the skin. 17. Wounds itch as they heal. 18. 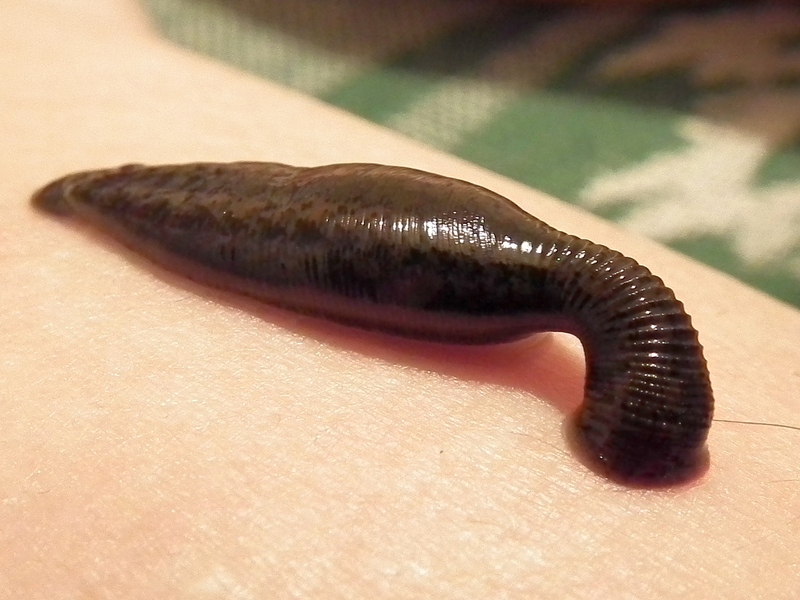 Leeches come in brown, black, and dark green colors. 19. They vary from 1″ (2.5 cm) – 12″ (30cm) in length. 20. Leeches lay eggs in cocoons. 21. In cold or dry spells they hibernate by burying themselves in the mud until conditions improve. 22. They have poor vision, but a highly-developed response to touch and vibration. 23 Many species are nocturnal. 24. Rainforest leeches are not aquatic. They thrive in vegetation and feed of warm-bodied hosts. 25. The use of leeches in US medical procedures was FDA approved in 2004. In leech-rich areas these tiny vampires will drop from their hiding places and inch towards you like something from a horror movie . . .
and the thought of plastic surgery drops even further down my to-do list!